When Jaws was released in June 1975, the industry probably had no idea that the film would make the impact on Hollywood that it has. The film (appropriately so) debuted in the summer, a time when most people were too busy with other activities to go to the movies. But this all changed when Jaws was released, and thus, the summer blockbuster was born. The film spent 14 weeks at No. 1 in the box office, terrorizing 67 million people when it first came out. Jaws made $7 million in its opening weekend, not chump change compared with its $9 million production budget. And now in celebration of its 40th anniversary, Jaws is heading back to theaters. Universal Pictures and Fathom Events have partnered to show the thriller on June 21 and June 24 at 2 p.m. and 7 p.m. in about 500 theaters. But before the killer shark thrashed its way onto the big screen in the film directed by Steven Spielberg, its origins go back to the best-selling book by Peter Benchley. The book and movie have since sparked a fear of going in the water, forever making us paranoid each time we jump in the ocean for a swim. While the killer shark took a bite out of Hollywood, it continues to be a staple of pop culture. Who doesn't know the line, "We're going to need a bigger boat?" And not only did the film change the movie industry through its wide release and enormous advertising campaign, its movie poster scored a first when it became the first poster image that became a merchandising product in itself. The sketch-turned-painting that would become the movie's official poster is the work of artist Roger Kaster. It was just another book illustration at first, he says, when he was asked by publisher Oscar Dystel to read the book over the weekend and come back with a sketch. And of course, no other visual in the book stands out more than first chapter with the shark and Chrissie (played by actress Susan Backlinie), the shark's first victim. "That's the scene after reading the book that I wanted to do," Kaster told Tech Times in an interview. He did a quick Magic Marker sketch in the office, and the rest is history. "It was the one movie poster that was the best for me. I could design it and do it the way I wanted to because Bantam [Books] approved everything that I showed them for the book," Kastel says. "Then Universal bought it for the movie, so it was really the easiest movie poster I ever did," noting that the studio didn't change his design. "When you think about it, in Jaws, the concept was — and it was a great one — to make it look real, but to have a poster look to it, and to take the most exciting part of the book or movie," Kastel says. The poster goes down in history as one of the most powerful images in film, setting the bar very high for those coming after it. Since then, we have seen the style and aesthetics of movie posters change. Let's take a look at their evolution. The poster for Alien was able to capture the essence of the movie with its dark design that features a giant egg, oozing with some sort of otherworldly light. 20th Century Fox hired Steve Frankfurt and Philip Gips from the graphic design firm Bemis Balkind for the poster, and the two were able to create an image that left a lasting impression on movie-goers until today. With Alien simply, yet boldly, written in white Helvetica font, the poster is almost as iconic as Jaws. Roger Kaster is also responsible for creating the famous poster for George Lucas' Star Wars: The Empire Strikes Back. "For the movie posters I've worked on, they are all through advertising agencies so they either gave you a layout to work from and of course, they supplied you with the movie stills, and usually the art director lays out the sketch, and you can change certain elements, but basically it's all designed before it gets to you." But for this poster, he had creative freedom to capture the film, although it didn't exactly start out the way it turned out. "In the Empire Strikes Back, I really didn't know what they wanted. I had done a sketch, and we had a meeting with the art director, and he told us Lucas wanted it in a romance," Kastel says. "It really floored me." His original design was of Luke on Tauntaun and Darth Vader in the sky. "It was a very dark poster, except for Luke being in the white snow area." But Kastel's final sketch was approved, going on to become to main poster for the movie. While illustrations were still used in the '70s, film studios began using photographs for their posters for the first time. But artist Richard Amsel illustrated the sketch of Harrison Ford for Raiders of the Lost Ark. The movie was not well-known in the weeks leading up to its release, so it's impressive what a good-quality movie poster can do for promotion. George Lucas is said to own the original movie poster. John Alvin designed and painted by hand the poster for E.T., using Michaelangelo's "The Creation of Man" as inspiration. Interestingly, he used a photo of his daughter to paint Elliot's finger for the poster. We still see the same trend of capturing the biggest moment of the movie to showcase what the film is about. This poster lives on as one of the most iconic of the '80s. Alvin was also the artist behind the original Blade Runner movie poster. He took an abstract approach this time around, showing the main characters that seem to overlap the futuristic city. There is also the light that is featured in the opening scene. We all know the poster for Back to the Future, where Michael J. Fox is standing next to the DeLorean, anxiously looking at his watch. The poster captured the essence of the movie so well that artist Drew Struzan was asked to create similar designs for the film's sequels. Tim Burton's Batman only needed one thing on the movie poster to sell it, its logo. The movie was so big that fans were shaving the Batman symbol onto the back of their necks. Talk about a pop culture influence. The logo was designed by Anton Furst, using as inspiration for the emblem the comic book character wore on his chest. The outlined edge and highlights added depth, and he changed the yellow to a bronze. Furst made the logo look cool, and it would go on to be featured on merchandise, much like with Jaws. Computerized effects are now used in posters, including Batman and Jurassic Park, as we shift away from movie montage scenes. John Alvin was also hired to make the poster for Jurassic Park. While we all know the poster for the 1993 film, Alvin initially used images that showed what the dinosaurs looked like, but Spielberg wanted to keep the dinosaurs a surprise. Instead, Alvin's work was never used, and Spielberg went with the logo of the theme park for the poster as original hand sketches began to become obsolete. There was no bigger movie in the '90s than James Cameron's Titanic. We start to see actors steal the spotlight in movie posters, and Leonardo DiCaprio and Kate Winslet appear on every poster for the blockbuster. Posters of the '90s featured the names of the actors either above the film's title or at the bottom of the poster, further making them the main selling points of the movie. Of course the ship is the star, too, as its position exactly in the middle of the actors is a play on the movie's plot. In the 2000s, more advanced computer software continues to make painting movie posters a thing of the past. 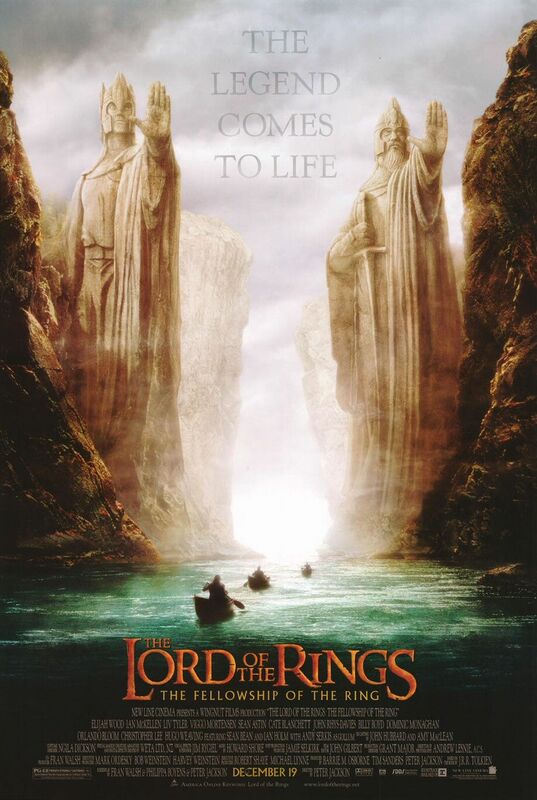 But The Lord of the Rings poster from 2001 still has that book illustration look to it, while keeping elements like the tagline at the top with the title and credits at the bottom. By mid-2000s, there are improvements in poster photography and typography, but the layout remains the same. The focus is more on special effects in action movies like The Dark Knight, with the poster looking like a snapshot from the film. The poster for Inception plays off the theme of layers and mazes in the movie, but aesthetically, we see movie studios relying on Photoshop to create the art for their blockbusters. "When it [a movie poster] was painted and there was a big change, you would have to get the painting back, repaint the area. It's a lot easier for the movie studios now," Kastel says, adding that since Photoshop has taken off, "I think all the agencies in New York City closed down that used to handle the movie work." But because of computer graphics and software, it appears that movie poster art is just becoming cheesy. Take the poster for Marvel's Avengers, for example. It basically looks like they copied and pasted images of the film's stars onto a background, and it became the epitome of lazy modern poster design. "I love the paintings because there are so many different looks to the style of the artist. And now a lot of the posters are absolutely gorgeous, but they look alike to me. It's not a human look," Kastel says. And nothing looks more fake than the Photoshopping on Robert Downey Jr.'s face in this poster. And now there is this creepy trend of characters facing away from the camera. We see this in the Captain America, 50 Shades of Grey, and even Mad Max: Fury Road. At least the poster for Mad Max uses the traditional layout, capturing a scene that describes the plot of the movie. So whatever happened to the original Jaws movie poster? Its whereabouts are still unknown, making it hidden treasure in film memorabilia.